In the face of the disruptions in today’s industries, Tech One Global further asserts itself as a pioneer of digital transformation with another exciting venture: education. 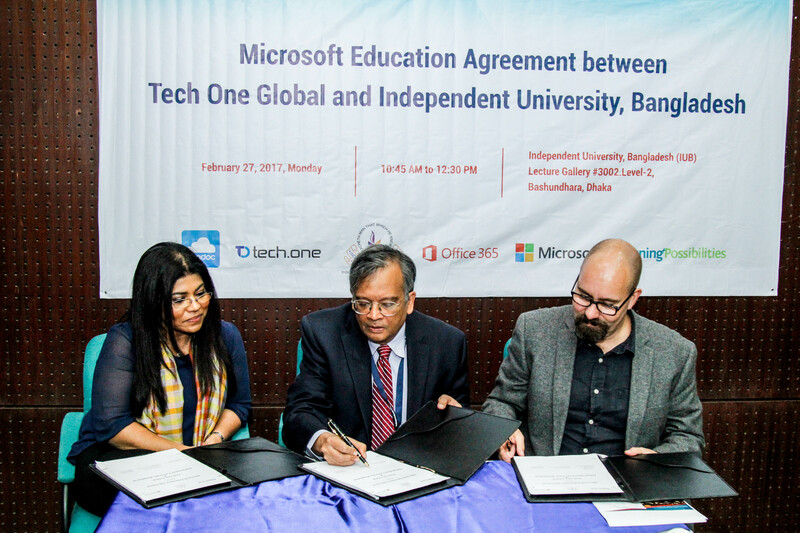 February 2017 — Together with Tech One Global and Microsoft, Independent University, Bangladesh is now ready to embark on a journey of digital transformation. IUB signed a Microsoft Education Agreement launching the start of a commitment to deliver a digital learning environment to students of the future. The event was at Independent University, Bangladesh at 27th of February starting off at 11 am with a welcome speech from Professor M Omar Rahman, Vice Chancellor of Independent University. IUB will be the first University to adopt cutting edge technologies that will drive transformation of its teaching and learning methods using market leading toolsets like Microsoft Office 365, the LP+365 Learning Management System, and Enadoc Student Record Management. Office 365 is Microsoft’s crowning glory for delivering digital transformation. Office 365 revamps not just a company’s business operations but its whole business experience by empowering its workforce with mobility, access, collaboration, and communication in a digitally disrupted cloud first, mobile-first world. Innovation is in digitization. Tech One Global believes that digitization of documents is a crucial first step in the transition towards digital. Enadoc is an innovative document management application that scans any form of document and secures them in Azure supported cloud. Armed with OCR, smart tagging, and a user-friendly UI, Enadoc is all you need to kick-start your journey in digital transformation. The Independent University, Bangladesh (IUB) was founded in 1993, and is one of the oldest private universities in Bangladesh where academic excellence is a tradition, teaching a passion and lifelong learning a habit. IUB’s goals are to produce graduates of international standards within the local environment, with knowledge and relevant skills to provide leadership in enterprise, public service and welfare; encourage and support useful research; create knowledge; and provide further learning opportunities for adults. Prof. M Omar Rahman, Vice Chancellor of IUB, is keen to bring the latest technologies to benefit the students and saw that Microsoft and partners Tech One Global and Learning Possibilities will offer relevant access to tools and services used by the ‘working-world’ – developing learners for the future and preparing them for life after education. Dr Mehool Sanghrajka, CEO of Learning Possibilities and the other officials of Independent University, Bangladesh, Tech One Global(Pvt) Ltd and Microsoft were also present at the event.